Apart from theory, this course includes tastings exercises, food and wine pairings sessions and a lab-based practical session. If memory serves right, the first intake of this wine course was held in april 2006. Its good to see the demand for this program being strong enough to see 21 intakes through. This course may interest those seeking employment within the local wine industry and also wine enthusiasts who wish to widen their knowledge on wine and wine appreciation. 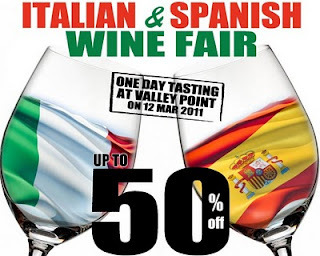 Its also a good way to meet wine lovers! Those keen to know more details on this course may wish to check out www.sp.edu.sg for more information. 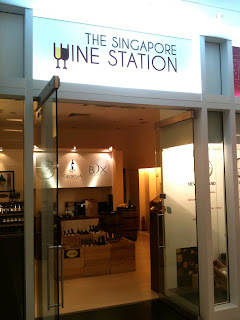 Swung by Valley Point to attend one of Crystal Wines' tasting session last Saturday. 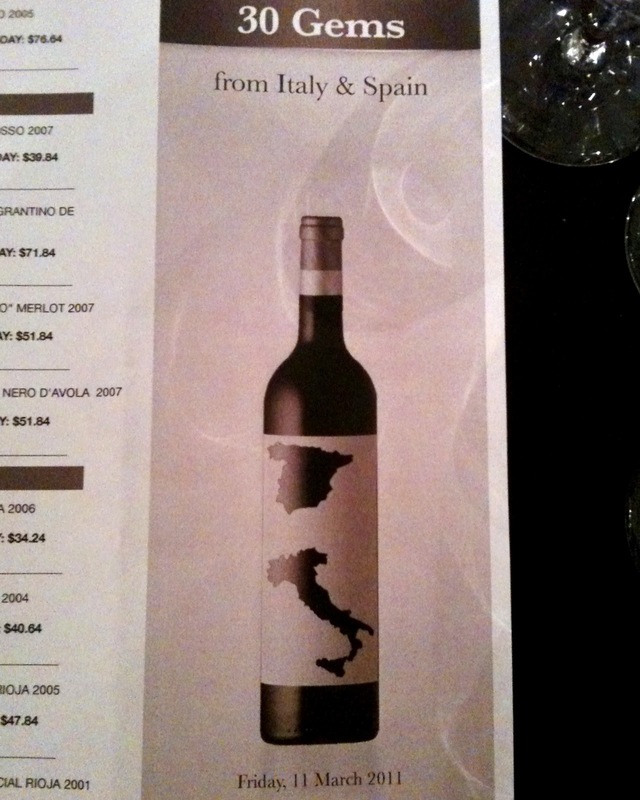 The tasting was on Italian and Spanish wines. This tasting was held in conjunction with its wine fair where up to 50% discount was given for some wines; a good margin indeed. a. 2009 Bava Rosetta Bianca (Moscato). An off-dry bubbly which is easy to drink with good body, flavours and a lingering finish. Will work a charm as an aperitif at any session and for those into off-dry wines. It will balance well with some of asia's hot and spicy cuisine too. It went for $20 during the session, a splendid deal. b. 2008 Bava Gavi di Gavi Cor de Chasse. A well structured white with pleasant yet subtle flavours. Its flavour intensity certainly wont overwhelm most food at any table. Be it salad, simple sandwich, pasta or pizza, it is likely to play a supporting role to enjoy the food at hand and yet make a pleasant sip. This too went at $20, again a good value-for-money deal. c. 2006 Uccelliera Rapace, IGT, Tuscany. A red made with a blend from sangiovese, merlot and cabinet sauvignon stood out among the other reds at the tasting in terms of aroma, flavours, fruits in mid-palate, smooth body and long finish. It can be drunk now or kept away for a few years to undergo further development. The price was $61, but worth the value. The joy wine brings. It's interesting to witness how that liquid in a bottle can bring a smile to one's face for different reasons. For some its about the quantity of wine imbibed during the course of an evening. Who has not heard someone close mention about that particular evening when a large number of wine bottles were uncorked and gleefully emptied during the session? And the smile on the chap's face when speaking about the event, does it not reflect the joy he feels? For others it's about the joy derived when tasting wine of certain characteristics; it can be from a particular region, or made by a famous winemaker, or a particular varietal or blend which makes the wine in the bottle special; not forgetting of course the excitement one sees when a bottle from a deemed exceptional vintage is being uncorked. And what about uncorking back vintages which have been sleeping for 2 to 3 decades? The curiosity, excitement and pleasure of discovery itself is enough to break a smile on one's face. There is the joy from sipping something exclusive; a bottle which comes from an extremely small production or that bottle from a reputed boutique winery. Then there is the joy which comes in drinking a bottle recognized by someone as a good wine; one which has won several awards, gained 99 or a 100 points from wine critics or met the approval of your wine mates. The joy related to the price of a bottle comes in two opposite forms. One is the joy in drinking an expensive bottle of wine which you seldom can afford and the other is in drinking a good wine purchased at a bargain price during a sales promotion or stock clearance. One other moment I can think of is when wine plays a supporting role; like the time you are having conversation and catching up with a good friend over a decent bottle of wine. The bonding session is made all the more joyful with that bottle on the table, though it isn't the topic of conversation. The joy which comes in sipping a wine which seduces one's palate and brings a smile to your face (it does not matter what the rest at the table think), that's one type of joy worth feeling.
" .. smoked salmon on toasted multi grain slice of bread, slice of fresh tomato, topped with assorted salad leaves and drizzling of olive oil ... in the glass italian Arneis ... I'm happy". 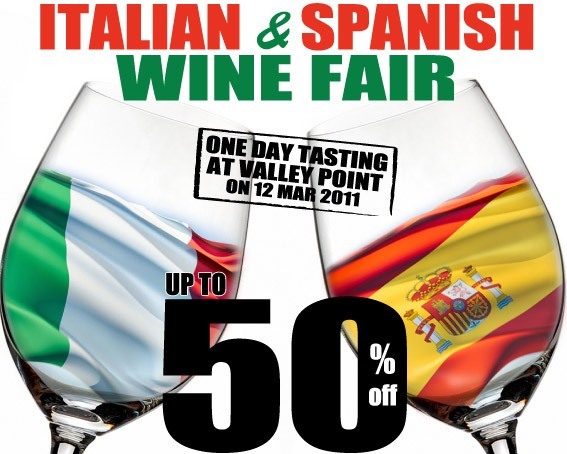 Last friday I visited The Straits Wine Company's latest retail outlet (at 180 East Coast Road) for a tasting of 30 italian and spanish wines. It's a tasting difficult to resist, as it came priced at a good value of $10. The 10 spanish wines offered for tasting comprised of 3 sherries, 2 whites, 1 rose and 4 reds from Rioja. Among the 20 italian wines there 2 proseccos, 2 whites and the rest reds. The 2 hour tasting session was well attended. Both the ground and upper floors were packed wine enthusiasts. a. 2005 Fanti Brunello di Montalcino. It shows well on the aroma and flavour profiles, but what impressed me most was the texture. Smooth, silky and well-integrated elements made the wine a pleasure to sip. b. 2007 Rocca delle Macie 'Tenuta Sant'Alfonso Chianti Classico Riserva. This wine speaks to the nose and its a joy just spending time enjoying the aromas. Palate shows a dustiness which adds to the rustic feel of this wine. I'll enjoy this wine with some food though rather than own its own. c. 2001 Bodegas Altanza Reserva Especial Rioja. Good fruit aromas and flavours well supported by soft tannins, lively acid and a supple body. Its drinking well now though for those who like to keep it a little longer, this wine be accomodate. A wine worth mentioning in the 'whites' department is the 2008 G.D. Vajra Langhe Bianco Riesling from Piedmont. One do not see many rieslings from Italy sold in Singapore. Even from a learning point of view, its good to have the opportunity to compare the flavour profile of rieslings from piedmont with those from wine regions across the planet. I enjoyed the balance within its body between the fruits and acid; while a few wine enthusiasts there voiced a preference for the searing acidity dominant in some cool climate rieslings from other wine regions. This year we come to another wine event organized by Hermitage. Its called the 'Burghound in Asia' tasting. A collaboration between Hermitage Wines and The Wandering Palate, it is on 9 April 2011 at The St Regis Hotel.The cost is at $98 for a tasting between 10am-5pm. This time round the theme is on Pinot Noirs and Chardonnays from around the world. Its nice to follow Hermitage's annual wine events over the years. The first wine event of Hermitage (called the World of Wines) I attended was in May 2008, when it organized a tasting of 50 wines at the Botanic Gardens. It began in the afternoon and went on till evening. A good crowd gathered by the second half of the session and the place was abuzz with wine enthusiasts discovering so many wines at one place. Back in 2008 not many wine merchants held outdoor wine events for the public and it was refreshing to see one such as this. The second World Of Wines event I attended was in May 2009. This time it was held at Spring Ju Chun Yuan at Far East Square. An afternoon event costing around $75, it drew good response and the place was packed by late afternoon. The third event was the 'Ultimate Parker in Asia' grand tasting held last year at The Fullerton Hotel. It was a 2 days event held again in May costing $180 (for a 2-day pass). The event was held at a bigger place, drew a bigger crowd and this time it had winemakers and owners of established wineries coming to showcase their labels themselves. If the wine events held the last 3 years are something to go by, I believe one can expect good support and response from the wine community in Singapore for the upcoming tasting. Was having a few sips with a wine group recently when someone there said that he intends to take the Certified Specialist of Wine (CSW) exam soon. Not having much time for studies, he plans to attempt the exam with current knowledge gained by pursuing other wine related courses (WSET courses) and his work experience as a wine sales representative. a. Don't just rely on knowledge gained by attending courses under WSET or Court of Master Sommeliers. These are great and well recognized courses (and will obviously give you a good foundation), but the CSW exam test you on material based on its own syllabus. Unfortunately the CSW syllabus does differ from WSET and Court of Master Sommelier wine courses. Its emphasis on history, geography (wine regions, esp that of US, Austria, Central and Eastern Europe) and wine chemistry is different. Though knowledge from other wine courses and work experience in the wine industry will greatly help to understand CSW's syllabus (and even answer some of the exam questions), the challenge will be to get sufficient questions right to pass the exam the first round. b. Sign up as a professional member of the Society of Wine Educators (SWE) and you will gain access to on-line study materials. It will cost you, but it will be worth the dollars and cents if you are serious about passing this exam (preferably in the first attempt). The on-line materials will give you an idea on the depth you will need to study and the key areas to concentrate on for each unit. c. Get the most recent CSW study guide. (Yup, its gets updated.) Its heavy reading with lots of facts to remember but at least you can rest assured that you are reading the appropriate materials for the upcoming exam. d. Attempt all on-line multiple choice questions (this really helps!). (You will be able to do this if you signed with the Society as a professional member.) It will give you an idea on the type of questions which can be asked for each unit and the level of difficulty the examiners are looking at when designing with multiple choice questions. I would advise you to attempt these questions again and again until you get all of them right. It will condition your mind to look out for relevant points to remember when reading the guide. You may also just find a few of these questions being asked during the actual exam. e. When attempting multiple choice questions, as important it is in knowing the right answer, at times it is just as important in identifying what is obviously the 'incorrect answers' among the choices given. But to gain this knowledge one has to be very familiar with the study guide. Going through the study guide as a 'light read' a few times helps one's mind 'figure out' the 'likely wrong options' when looking at a multiple choice question. The Greywacke label is a new addition to the wines coming from NZ. Thursday at Ponti Wine Cellars wine enthusiasts had the opportunity to taste wines under this label. Kevin Judd, Greywacke wines winemaker himself, was present to introduce his new wares. He made Singapore part of his Asian tour to promote his new label. Wine folks will know Kevin Judd through his earlier job as the first and long serving winemaker of Marlborough's award winning and well known Cloudy Bay Estate. He produced its first vintage and has been making wines there for 25 years. Presently Kevin produces wines under his own label (year 2009 being the first vintage). We had the opportunity to taste 6 of his wines; a good range I must say. He is also known for his other interest, which is photography. He has spent some time capturing memorable facets of NZ's wine landscape. Greywacke Marlborough Sauvignon Blanc 2010. A classic Marlborough style with ample fruit and body in mid-palate to stand against the acidity. One finds typicity here. Greywacke Wild Sauvignon Blanc 2009. Its a 'like it or frown-at-it' type of wine.Using wild yeast for fermentation and adopting a minimalistic winemaking approach certainly brings out a different aroma, flavour and texture profile in this wine when one attempts to compare it with the earlier SB. Greywacke Riesling 2009. Youthful wine with good mid-body, a hint of 'petrol' and lots of lime showing on the nose, and a crisp finish. Greywacke Pinot Gris 2009. Made with low-yield and handpicked grapes, it leans slightly towards the Alsace style of PG showing more fruits, ripeness and a hint of fruit sweetness in the finish. Greywacke Pinot Noir 2009. Shows good red fruits in nose and palate. One is able to enjoy the fruit which shows in mid-palate before being charmed by the acidity enveloping the fruit. Still young and with a potential to show better with a few years of aging. Greywacke Late Harvest Gewurztraminer 2009. Lovely fruits and spice slay one's nose and palate in this wine. Unfortunately the Greywacke Chardonnay 2009 was not part of this tasting; something to look forward to in the near future I guess. The Greywacke label will certainly make a good addition to the growing number of NZ wines one can recently find in Singapore. Ponti Wine Cellars which was located at 11 North Canal Road has shifted to a new location. Since last week, it's located at 204 Telok Ayer Street. I almost went to the old location yesterday (and my wine buddy did!) while on our way to attend the Greywacke wine tasting organized by Ponti. This new place seems slightly narrower but certainly longer. The decor is simple yet tastefully done. The good range of wines it usually carries is still there for enthusiasts to browse around and purchase. Its located within a shophouse surrounded by quite a few eateries. The Amoy Street food centre is also located just a stone's throw away. This offers one an ample opportunity to purchase a few bottles and pair them with the wide variety of local cuisine found in this food centre. You certainly needn't worry about paying for corkage at this food centre. All you need is to bring along your own glasses and a plastic wine bag to chill your wines. Recently, I received a wine opener as a gift. My regular sipping mates know that my curiosity about things wine extend to wine accessories and wine-related books as well. So occasionally I get new additions to my little collection of wine-related nick-nacks when they come across something new or interesting. This wine opener was bought locally at a fair in the east for around $30. Its lightweight, though slightly bulky to fit into a pocket. It works on a slightly different principle from a waiter's corkscrew (which tends to be used more frequently in most places in Singapore). 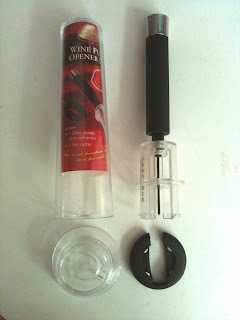 A handy circular foil cutter is provided to remove the top layer of foil found atop wine bottles. Then you insert fully a thin long 'hollow needle' into the exposed cork till the needle pierces through the cork at the other end. Lastly, you extend the handle attached to the needle and start pumping air into the bottle. When sufficient air pressure builds up at the bottle neck (in between the space between the bottom of a cork and the surface of wine in a bottle), the cork gets 'forced' upwards and comes off the bottle. It's easy to use, even for those new to uncorking a bottle of wine. One advantage this 'pump-opener' has over a waiter's corkscrew is the fact that a cork can be removed from a bottle without 'bending' the cork at all (it leaves a bottle 'upright'). This greatly reduces the chance of a cork breaking mid-way when one is attempting to uncork a bottle. It therefore makes for an ideal opener when uncorking an aged bottle of wine (where at times the corks tend to be soft). However I notice 2 problems when using this at home. Firstly, at times it can't securely fit unto a wine bottle (in which case you have no choice but to rely on other types of corkcrews you have at home). Secondly, occasionally there are times when all the pumping effort does not budge a cork at all (the air obviously is escaping but it is difficult to find out how). I find this a handy opener to have at home rather than one to bring it around when I go out to town for sipping expeditions. However, if I am bringing along some old bottles where the corks may be soft, I will be tempted to throw a wine pump-opener into my bag ... just in case.